I did my M.A. in English Language Teaching and Delta at Leeds Metropolitan University, now Leeds Beckett University, gaining distinctions in all three Delta modules and a distinction overall for my M.A. Since then, a large number of searches relating to the Delta and M.A. both with regards to Leeds Met specifically and in general, have brought people to my site. This page gathers the links to all the relevant posts, together with snapshot information about what they contain. A post about doing the Delta at Leeds Met, originally posted as a guest post on Sandy Millin’s blog site. A post about doing the M.A in ELT at Leeds Met, based on the same format as the above post but focusing on the M.A. portion of the course. A post about the outcome (in terms of grades – and what they mean), for me, of doing the Delta at Leeds Met. 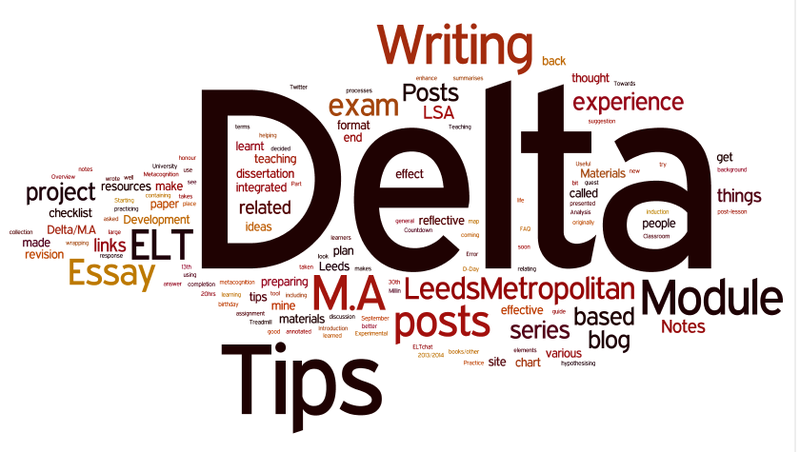 A post containing an annotated list of various books/other resources I used in preparation for and during my Delta at Leeds Met. A post about attending the Leeds Met Delta/M.A. ELT induction for 2013/2014 to answer questions and share my experience with the new cohort. A bit of a Delta FAQ! The Delta/M.A. Treadmill: A tongue in cheek collection of tips to surviving the Delta. Countdown to Delta Module 1: A checklist for anybody preparing for Delta Module 1 exam, based on what I did to prepare for mine. Doing the Delta: A post that brings together all my links and many others besides in a guide to doing the Delta, presented in Q&A format. More links will be added here as I post them – coming soon! 30 things to enhance your teaching? The 30 things (in honour of my 30th birthday!) that I’ve been most taken by – including ideas, approaches, tools and techniques – while studying and teaching over the past year. Bringing Metacognition into the Classroom Towards the end of an #ELTchat discussion on Twitter, @Sandymillin asked for ideas of how to develop skills, rather than just practicing them, at intermediate level – as a means of helping learners get off the intermediate plateau. I piped up with the suggestion of using metacognition. Sandy recommended that I blog about what I meant by this, and so this post materialised. Materials Development: What is it that makes materials better than good? A post that I wrote in response to assignment work I was doing in the Materials Development module of the M.A. I decided to use my blog as a reflective tool while doing my dissertation project – the final part of my M.A. in ELT – hypothesising that this will make it an even more effective learning experience for me, by mapping it, enabling me to look back on my thought processes and decisions and see what effect these have on the project development. Once I get to the end (13th September is D-Day! ), as well as looking back over the experience of doing the project, I plan to try and evaluate the effect of these reflective blog posts on it. Here are the posts that form part of the series. Dissertation Diary 1 The beginning: first tutorial, making decisions about what type of materials to make, considering related issues. Dissertation Diary 3 An initial plan for my materials and rationale of this. Dissertation Diary 4 Another tutorial and a lot more to think about! Dissertation Diary 6 A complete draft of the framework for my materials and a lot of the theory it relates to. Dissertation Diary 7 Mapping the framework to the theory and principles, to ensure there is justification for each element. Hi thank you for all the information on your blog. I am a secondary English language teacher in Italy. I would like to know if it is possible to study the M.A. and Delta integrated course at a distance with Leeds Met. I wanted to ask the university directly but cannot find a contact. Thanks in advance for your help. I know that it is possible to do Delta module 3 online, and that it’s also possible to do some M.A. modules by distance. But I would suggest you contact Heather (H.Buchanan@leedsmet.ac.uk) or Naeema (N.Hann@leedsmet.ac.uk) for more and better information. I wrote it with only the guidelines in the handbook to help me, as I couldn’t find a mentor who’d work with me. It was an interesting experience, but it might have been easier if there was any support online.